The paralleling controls that have been utilized over the past ninety-eight years have included simple rheostat speed controls with Silverstat voltage regulators through the analog automated controllers and now into the digital age of controls. Our latest controls employ the Compass Control System as its’ touchscreen-based operator interface which provides enterprise visibility as well as significant operational redundancy. 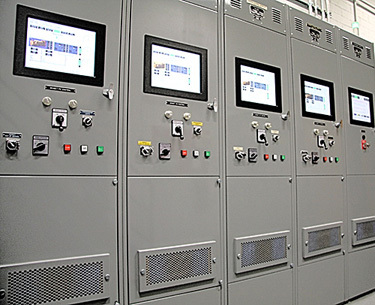 We employ the power of PLCs for our start-stop generator control and monitoring interfaces which enables us to provide significant retrofitting capabilities for existing assets and infrastructures. Our controls implementations are not limited to any particular type of motive-driven methodology. We can apply our paralleling gear to medium or low voltage systems, island or intertie, co-generation, open or closed-transition automatic transfer systems with unlimited priority load acquisition/load shed. We have developed advanced algorithms for our load acquisition/load shed controls which greatly minimize impacts to loads due to overloads of the generation capacities. The system provides a separate control section for each generator and a totalizing control section for the summarized monitoring and control of the system.